The small island of Aruba has as many diverse attractions as any one could imagine. From the enormous desert sand dunes to the lush tropical gardens of the Butterfly Farm perfect for exploring and observing the most colorful of creatures of nature - a rare opportunity for photographic memories. There is an observation tower which has been erected at the water treatment facility which empties into a two tier man-made lake, known as the large and small Bubali Bird Ponds. This has become a nesting and breeding area for more than 80 species of migratory birds such as herons, egrets, gulls, skimmers, coots, cormorants... and ducks and more - a heaven for bird watchers. 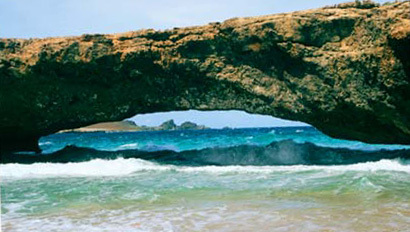 Eighteen percent of the island of Aruba is part of the Arikok National Park. The park is the habitat of several animal species found only in Aruba - including two snake species, the Aruban whiptail lizard, the Aruban burrowing owl, Aruban parakeet... among others. There were several phases of Native American occupations in Aruba, each leaving behind artifacts and evidence of the inhabitant's presence, which are preserved in the park. Fort Zoutman was named after a Dutch Rear Admiral who outwitted the British during the 4th British War. The tower was located on the shoreline and was armed with four cannons - which are still on display. 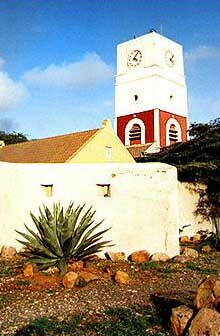 The Tower of Willem III was added to the Fort and it also contained Aruba's first public clock. Fort Zoutman contained the government offices - the police department and a prison. The tower served as a lighthouse and this structure has been utilized since 1868. Today the buildings house the Museo Arubano which is a museum displaying many artifacts reminiscent of colonial times to the present day. The old stone California lighthouse is popularly named for the off-shore wreck of the famous ship, "California." 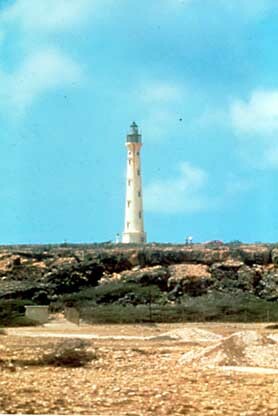 The lighthouse has become one of Aruba's scenic trademarks and offers a picture perfect view of the island's western coastline of sandy beaches. There is a restaurant nearby the lighthouse that offers fine dining at night and lunches during the day. The northwestern tip of the island is known as "Hudishibana" and has large rolling sand dunes and a rocky coral shoreline. These are named the "California Dunes". Aruba's desert landscape gives it image of cacti, aloe and huge gigantic hills of sand. Exploring these dunes by means of a four wheel drive jeep is a popular activity. highest and most dramatic coral structure. This is the island's most photographed attraction and is located on the north east coast and is easy to drive to. This site makes for fantastic picnics or a cool swim and the bridge acts as a buffer from the crashing waves. Nearby on your drive you will pass the gold mill ruins at the tip of the Spanish Lagoon, the site of the world's second largest desalination plant. From horseback riding tours to 4-wheel drive jeep racing up and down the sand dunes - Aruba is exciting, varied and romantic. There is a tour along a rocky trail that leads to one of the most romantic spots on the Isle of Aruba. 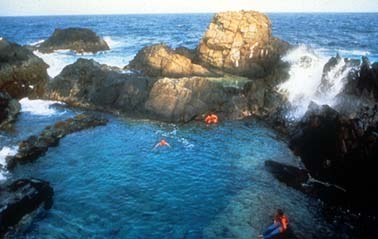 The Natural Pool is made up of an outcropping of rocks, forming a natural pool large enough for swimming on the northeastern coast. The rocks protect the pool from the northeastern ocean winds and rough surf. An experience right out of the Tarzan era.